Previously I discussed how I was researching some REITs with a goal of buying another REIT to replace the shares of HRPT Properties Trust (HRP) which I sold after it doubled. First I screened for a list of REITs with yields over 9% and I took a look at those and crossed off all but three. Second I looked at those three remaining REITs. The final 3 REITs were: Northstar Realty (NRF), Mission West Properties (MSW) and UMH Properties (UMH). I ultimately decided to buy Northstar. They have strong financials and good potential for share rebound. The main risk concern with Northstar is that they have exposure to defaults on the commercial loans they own. But I have good confidence in the economy is on a rebound at this point and if I'm going to invest in REITs at all then I have to believe commercial properties are generally over the worst of it. I bought 400 shares of Northstar at about $3.52. I'll again note that I am not a professional financial expert and this should not be taken as financial advice in any way. The primary way that I am going to 'dig deeper' into researching these 3 REITs is to read the recent annual reports. I should take a moment to again note that I'm not a financial advisor nor a professional in the finance industry in any way. My discussion of stocks should not be taken as financial investment advice. One thing to note about Northstar is that right now the basic financial summary is showing a very large earnings level. This seems due to a substantial unrealized gain on investments from 2008 being reflected in the stats. I took a look at their 2008 Annual Report. A few key things I found: Page 5 of the annual report has pie charts showing the distribution of their loans both by sector and location. Their loans are spread across various types of real estate and spread all around the country. Page 11 has a table about the properties they own. 60% of their property value is in healthcare and 25% is in office space. Page 30 shows that barely over 1% of their loan portfolio was non performing. So they are well diversified, they have properties mostly in fairly stable healtcare industry and their loan portfolio isn't showing large defaults. These 3 points are all positive items. On the other hand my primary concern about Northstar is the potential risk in all the loans they carry. Northstar's stock has been over $8 within the past 52 weeks and right now trades under $4, so there is lots of room for the price to rebound. Their 2008 annual report is on their website. They have 111 properties in Silicon Valley with a 66% occupancy rate. The list has the names of their tenants and the rent paid per property. Microsoft and Apple are on the list and those two tenants pay about 25% of the rent that Mission West receives which is a pretty positive point for them. Only 2% of their leases are due to expire in 2009. They refinanced $115M in debt in 2008 at a 6.2% rate for 20 years. Their tenant base and financial situation seems fairly good, but on the negative side they are not well diversified at all and all of their income is dependent on the Silicon Valley area and primarily high technology companies. Mission West stock price is about $6.70 right now and it had a high of $9.88 so its down about a third from its 52 week high. Their website is at UMH.com. The 2008 annual report is available on their site. On page 2 of the report they say that they have a portfolio of about $25M in home loans. These loans are made to individuals who have bought mobile homes on their properties. On page 7 of the annual report they list the financial figures for 2004 to 2008. Funds From Operations (FFO) has dropped every year for the past 5 years. In 2004 their FFO was over $11M and in 2008 it had dropped to about $5.5M. Overall UMH seems to be in OK shape, but the general trend of FFO is very concerning. UMH stock price hit its 52 week high of $9.09 earlier in August. Since then it has dropped back down to $7.88 so its not far from its recent peak. Tomorrow I'll talk about which of the 3 REITs I decided to buy. It shouldn't be a secret that more banks have been failing lately. I've seen some news lately raising concern about the deposit balance of the FDIC and worrying that the FDIC will run out of money. It seems that people think that the FDIC is about to crumble and that all our insured money will be in jeopardy. Is the FDIC going to run out of money? Right now the FDIC has about $10B in it's reserve. With the number of 'problem' banks right now and the potential losses from their assets if they fail it is possible the FDIC could run out of funds. But if the FDIC runs out of money that doesn't mean that the FDIC will evaporate or that the guarantee on your bank held savings is going to go away. The FDIC is backed by the United States government. If the FDIC deposits ran low then they could look to the government for aid. It is a given that the government would do what is required to keep the FDIC solvent. Should you be concerned that the FDIC is running low on funds? Well let me ask you this, were you concerned in 1991 when the FDIC ran out of money? You may not have even remember or noticed at the time that it happened, but it did. If you look back at the FDIC data for previous years then you can see that the situation was a lot worse in 1991. As you can see in just about every way, the situation was worse back in 1991 than it is today. If the FDIC didn't crumble in 1991 then it isn't likely to crumble today either. It certainly isn't a good thing that there are more banks are failing lately and that the FDIC reserve is dropping, neither are a sign of the imminent doom of the FDIC. The site ProPublica has a page called Eye on the Bailout which tracks all the details of the government bailout funds. They have information on who got the money, how much they got, whether they've paid any back and if they've paid dividends or interest. How was the money allocated? There is a full page on the programs which describes all the initiatives and programs that the government had in the bailout. Keep in mind that the money was allocated in a few ways. Some of it was capital investment in banks where the government got preferred stock shares which pay dividends. Parts of the money was in the form of loans which pay a fixed interest. They have a page that lists the recipients of the bailout funds. For example of one large institution, check out the page for Citigroup. There you can see that there has been a $50B commitment to Citigroup from the government and that Citigroup has paid about $2B so far in dividends or interest. That is a 4% return. Thus far Citi has returned $0 of the money. There is a list of companies who have returned funds and how much. So far $71.9B has been returned. One example is J.P. Morgan Chase which has thus far returned the most at $25B. In fact JPMorgan Chase has returned 100% of the bailout money and paid $795M in dividends and interest. Thats about a 4% annual return on the money. How much has been paid in interest and dividends? The dividend and interest payments are listed for all the companies. In total the government had received over $10B in interest and dividends. The EnergyStar site has a page on heat pump hot water heaters. These are a standard tank water heater but they heat the water using a heat pump. Heat pumps pull heat out of the surrounding air which is much more efficient than creating heat from electricity. The result is that heat pump water heaters are much more efficient than a standard water heater. The annual energy costs of a heat pump hot water heater is around $220 or less. By comparison a standard hot water heater could cost you $500 or more. A heat pump water heater could save you close to $300 a year. The exact costs of either style water heater will depend on your utility rate and usage levels. Unfortunately it looks like the Energy Star rated heat pump water heaters aren't for sale just yet. GE talks about their model they call the Hybrid Electric Heat Pump on their website and they say it will come out in November 2009. Since the models from the EnergyStar site aren't available at retail yet I don't see any prices on them. However, found an article discussing a GE heat pump hot water heater that cites the cost will be in the $1,200 to $1,500 range. Standard 50 gallon electric hot water heaters sell for $400 to $450 range at places like Lowe's or Home Depot if you want a model with a decent warranty. So the heat pump hot water heater will run you around $750 to $1100 more than a standard model. However you could be eligible for a 30% tax credit to offset some of that cost. If you get the full credit then that will save you $360 to $500 off the cost. That would make the total difference something in the $250 to $740. The payback period will be in the 1 to 4 year range depending on the exact annual savings, amount you pay and tax impact. At the time that I'm writing this the heat pump water heaters aren't quite out on the market, but they will be soon. When they are available, I wouldn't rush out and buy a heat pump hot water heater unless you currently need to replace your water heater. But if, or when, your water heater breaks down then upgrading to a heat pump hot water heater will be a good investment and save you a lot of money in the long run. I just got an email from Costco about a class action lawsuit against them. The mail has the subject of "IMPORTANT INFORMATION ABOUT A CLASS ACTION SETTLEMENT"
One of my first thoughts seeing this email was "oh, so Costco has been ripping us off forever and now I'll get a 10% off coupon and the lawyers get $8M in fees?" But my cynical conclusion is not right in this situation. I decided to take a closer look at this settlement and see what its all about. Note : I'm not a lawyer and what I'm saying below is my own personal opinion reflecting on the documentation I'm reading about the law suit. Nothing here is meant to constitute legal advice or legal opinion. "The Court in In re Motor Fuel Temperature Sales Practices Litigation, Case No. 07-MD 1840 (U.S. Dist. Ct., KS) has preliminarily certified a class comprised of the persons identified above and preliminarily approved a proposed class action settlement. The complaint alleges that Costco (and others) misled consumers by marketing motor fuel at temperatures above 60 degrees Fahrenheit without adjusting for the fuel's temperature. Costco denies any wrongdoing." So basically there is a lawsuit against Costco saying that they sold gasoline at a high temperatures without compensating for the temperature difference. Why does the temperature of gasoline matter? If you remember your high school science class you'll recall that things expand when they get hot. Gasoline will expand in volume when it has higher temperature. However the amount of energy in the gasoline is based on the weight not the volume. So when gasoline is warmer its volume expands and you're essentially paying for less energy. Think of it as kind of like paying for some hot air along with your gasoline. That analogy is not exactly accurate but gets the idea across. How much does the temperature of gasoline it matter? This report from a Oversight and Government Reform Committee in the House of Representatives on the topic says that the volume will change by 0.069% difference per degree Fahrenheit. So if you have a 30 degree difference then thats about 2% change. Therefore if gasoline costs $2.80 at the pump and you pump it at 60 degrees you'd get 1 gallon but if you pumped it at 90 degrees the volume would be 2% difference so you'd have to pay $2.856 to get the same amount of energy. This represents a worst case situation. So at the very worst you might be paying a few cents more a gallon. However this can add up over millions of consumers. The impact depends on the climate. Here is a report that shows the average temperature per state over the year. Of course its colder in Alaska and hot in Arizona. But for most states the average temperature is in the 60-70 degree range. For states like Idaho or Indiana the average temperature is close to 60 degrees. While the temperatures are higher in the summer they also drop in the winter. So the average is what you're really paying over the year. Your gas may be 1-2% more in the winter and 1-2% less in the summer. For Southern states the temperatures are higher and average gas volume is 1-2% worse. Georgia has an average temperature of 72 and Florida's average is 82. So those states are paying 0.8% and 1.5% more than the 60 degree level. In Alaska the average temperature is only 46 degrees so they are coming out ahead in the deal. Costco is not being evil here at all. In fact it turns out that "everyone does it". According to the report cited by the Oversight and Government Reform Committee study they said "Though technology exists and has been accepted for near universal use in Canada, no U.S. retailer of gasoline compensates for temperature when selling to consumers." So this appears to be standard practice in the gasoline industry. Costco simply did what every gasoline vendor does. I would not say that Costco is doing anything particularly misleading. In fact in the suit points out that in Dec. 2007 that Costco posted notices at their gas pumps saying: "This device dispenses gasoline solely by volume measured in standard gallons (231 cubic inches). It does not adjust for temperature or other factors which may affect the energy content of each gallon dispensed." So Costco even told us what they were doing explicitly if anyone had bothered to read the notices. What will the class action lawsuit do? Will I get some money or at least a lame coupon? The details of the class action are in a couple documents posted at the Costco website. The document Fuel Settlement Detailed Notice explains the basics of the suit. It has a section 4. "WHAT DOES THE PROPOSED SETTLEMENT PROVIDE?" that explains what the proposed settlement will require Costco to do. The meat of it is that "The proposed settlement provides that Costco will convert its motor fuel pumps in ... [list of states] ... to “automatic temperature correcting” pumps over the next five years ... " The document then goes on to say that : "No payments will be made to any class members, except as stated in 9 below." and section 9 covers the cost of legal fees and rewards of $2,500 for the people who filed the suit initially. Bottom line is that Costco has agreed to convert their gas pumps to automatically correct for the temperature difference and they are not going to pay customers anything. Costco has sold gasoline without accounting for temperature. This is apparently what every gas retailer does and Costco had a notice posted saying so. I don't see any wrong doing on Costco's part. The impact of the temperature can be minimal in some states with cold and hot days averaging out over time. However warmer Southern regions can see up to 1-2% difference in the actual gasoline received. Costco has admitted no wrong doing but they agreed to install temperature adjusting equipment at their gasoline pumps as the proposed settlement. I bought a couple REITs in my Roth IRA and one of them already doubled. I sold half my stake in that REIT. Now I'm looking for another good value to invest that money so I figured I'd take a look at the REITs out there to see if any represented good buys right now. I did a quick screen of all the REITs with dividend yield of 9% or more. There were only 9 REITs with yields that good at the time of my screen. I discarded any REITs that have negative earnings. I looked at each REIT and then decided if I'd cross it off my list or take a closer look. Below are the REITs that come up on my screen and what I found from looking at the Yahoo financial page for each. Note: I am not a financial advisor or financial expert. What I present here is my own opinion and does not represent investment advice. This one looks good in a lot of ways. They have a lot of assets and cash. They have pretty good revenue compared to the share price. The PE is a tiny 0.4 right now. Their dividends have gone down but are still paying a hefty yield. The main potential problem with Northstar is that they invest in real estate investments so they may have bad debt on their books. But they also have pretty substantial direct ownership in physical properties. I'll investigate this one further. I think that medical property is a very safe bet. Medicine is pretty recession proof and you don't often see hospitals or medical professionals closing shop. If anyone outside government is going to pay their rent with safe reliability I think it would be medical industry. One negative on MPW is that they only have about $7 million in cash. Thats not very much for a REIT with $1.1 billion in assets and over $560 million in debt. Looking at their quarterly cash flow it seems they're barely able to pay their dividends. Back in Q1 they sold 12 million shares of stock for $5.40 a share. I'll cross this one off my list. This one looks ok at first glance but they are paying dividends with 10% cash and 90% stock rather than 100% cash. I think the fact that they are paying dividends in stock is a sign that they are probably having cash problems. Looking at their balance sheet you can see that their assets have been dropping and their income statements show that their income is dropping. They also don't seem to have a lot of cash on hand. This one doesn't look very strong financially and the trends aren't looking good. I'll cross this one off my list. OK my first thought is that if this company deals in storage rental properties then that would be a good business to buy into. I think Americans spend way too much money on storage rentals, but that would be a good thing for a company that owns those properties. Unfortunately closer examination of the REIT turns up a couple negatives. First they have suspended dividends until Q4 and they only expect to pay $0.24- $0.30 then. That brings their total dividend for 2009 to something around $0.50 to $0.55 and makes the yield actually about 4.5% to 5% range. Another big negative that I saw is that they are paying dividends in 10% cash and 90% common stock. Because of the situation with their dividends, I'll cross this one off my list. PMC is primarily in the business of originating commercial real estate loans. Most of their loans are under a Small Business Administration program and are guaranteed by the SBA to an extent. They've cut dividends two quarters in a row. Their dividend rate seems to fluctuate a lot from quarter to quarter looking back a couple years too. I'll cross this one off my list. They have negative earnings. They've cut their dividends a couple times in the past two years. Its a retail REIT so they are dependent on the retail industry. Their debt went up a bit in 2008 and their equity / debt ratio isn't very good at around 0.9 level. I'll cross this one off my list. Mission West specializes in R&D properties in Silicon Valley. That is a fairly narrow focus on in properties in one local market that are mostly dependent on the high tech industry. Their financials look OK but nothing fabulous. Right now the dividend rate is 8.7% which has been dropped since Q1. They have a decent amount of cash on hand. This one looks OK with no major problems but I am a little concerned that they aren't diversified enough. I'll investigate this one further. This REIT invests in mobile home parks. Their financials are fairly stable and they have actually been generating cash in the past few quarters. Their cash balance is not great but not horrible. This one looks interesting and doesn't have any major negatives. I'll investigate this one further. 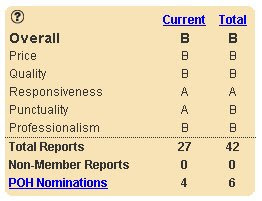 Next time I'll look at the annual reports for each of these and see what I can dig up in those. Right now there is a 50% off sale on premium photo products at Vistaprint. So you can get stuff like photo calendars, photo notebooks, photo flip books and even totebags with photos on them for 50% off. Ebates also has 6% cash back for Vistaprint. I haven't used Vistaprint myself, but if you're in the market for something like a photo calendar then this looks like a decent bargain. However, I'm not going to recommend this sale. Why? After I started to write this I figured I should check out Vistaprint to see if they are any good or not. I did a quick Google search for "vistaprint review" and the 4th hit was Amazon Customer Reviews : Vistaprint. 22 out of 43 reviewers gave them 1 out of 5 stars. That is not good. One reviewer says that they use Vistaprint 10-12 times a week and usually get a couple orders with errors and then they have difficulty getting Vistaprint's customer support to fix it. Another review page at Resellerratings has a 6.1 out of 10 review score for Vistaprint with average stores getting 8 out of 10. So thats two sites that have a bunch of negative reviews for Vistaprint. This is evidence of why doing a little research when you're shopping can be well worth it. Its not always the best idea to go with the cheapest merchant. I'd much rather spend a few dollars more and get a quality product without problems. Recently one of our renters vacated our property without telling us. Thankfully they didn't leave owing substantial amount of rent and we didn't have to go through the hassle of evicting a non-paying tenant. On the negative side however we now need to put some work into cleaning up the place and getting it ready to rent out again. The house needs cleaning, a new fridge and new carpet. I'm thinking that all together that this will cost us something around $2,000 to $3,000. When you are renting a property you should try to plan for the unexpected. How can you plan for the unexpected? You can't cover every possibility but you should at least put in some expectation that you'll have some vacancies and some occasional repair and maintenance costs. Vacancy and maintenance costs should be taken as routine occurrence with a rental and built into your budgets. But its also best to minimize the impact of these occurrences. You need to plan for it in advance and work quickly to rerent the unit. Plan for some vacancies - Rentals usually have a vacancy rate in the 5-10% range. So at any given time 5 to 10% of the units are unrented. This is commonly due to turnover and some lack of demand. Personally I figure that on average 1 month out of the year you might have a vacancy. Usually I'd hope to keep renters for longer but on average you'll probably get people staying 6-24 months with the average tenant lasting a year. Whenever theres a vacancy you'll likely lose some rent when while you're showing the place to the new tenant. Have a budget for repairs and maintenance - Repair and maintenance costs come in two main categories. You'll get random things failing like a broken appliance or a plumbing malfunction. These repairs are in the $100 to $1000 ballpark depending on the exact nature of the failure. You also have maintenance costs for major items. Eventually you'll need to replace the roof, get new appliances, replace the carpet, maybe get new windows, etc. For any property you own you should account for these costs and plan for them. Try to minimize vacancy time - Right now our focus is on getting the rental fixed up and ready to rent as soon as possible. Every day that goes by with the unit unrented and being worked on is 1/30th of a months in lost rent. Its important to get a vacancy turned over and filled as fast as possible. We learned this lesson a few months ago with a property that we spent far too long working on. Personally I think this is one instance where Do-It-Yourself work can backfire financially. If I did all the work myself it would take substantially longer and I would end up losing more rental income than it would cost me to hire a professional to do the work quickly. JD at Get Rich Slowly wrote Slash Your Grocery Bill With Store-Brand Products where he found that he saved average of 36% buying store brands over name brands at one grocery store. 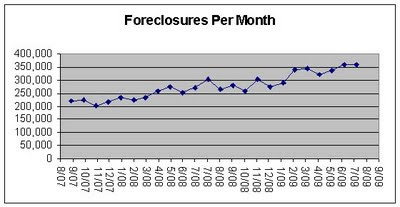 As you can see foreclosure activity has been steadily increasing and has not yet shown any signs of dropping. Note that these figures do not directly represent 'new' foreclosures but are a measure of foreclosure activity. I'm not sure but I think there may be duplication in the filings for each property with a property getting a notice one month and another notice a couple months later. But as a whole if the number goes up then that does accurately reflect an increase in foreclosure activity. Realtytrac has only been tracking this figure since 2005 so there isn't much of any historical data to look back at. Their press releases only go back to 2007. Note that the foreclosure rates vary widely from state to state. In one of their releases from early 2009 they broke the figures out state by state. At that time, California had more than 1 in 200 homes received a foreclosure filing but in Vermont less than 1 in 50,000 homes was in foreclosure. Lazy Man and Money is one of my top 10 favorite blogs. A while ago Lazy Man wrote about the company Monavie with his article Monavie Scam? Now their lawyer is sending Lazy Man a cease and desist letter trying to get him to remove their name from his article. I am not a lawyer, but frankly I think their legal argument is horrible. Lazy Man is obviously providing commentary on their product. This has got to qualify as legal use of their trademark. Otherwise how could any news source ever report on any trademarked company? The legal argument from MonaVie appears to hinge on his use of their trademark in his metatags. But metatags are simply descriptive keywords about a site. MonaVie is apparently hoping that Lazy Man will be scared of a lawsuit and he'll remove their name from his site. A little while back I mentioned that I had bought some Bristol Meyers Squibb in my Roth IRA. At the time I also mentioned the other holdings in my Roth. One of the stocks that I bought was a REIT named HRPT Properties Trust (HRP). That REIT has been going up pretty quickly the past 3 months. HRP has gone up over 90% since late June and has more than doubled from the price that I paid for it. I paid $3.61 for HRP in Nov. 2008 and it hit $7.30 today about 10 months later. Thats a 102% increase. Why is it up so much? Frankly I don't have a good answer. The market has been going up in general and REITs have been rebounding. But HRP is up much more than the market or REIT sector. I don't see any news about HRP recently that would give reason for such strong increase in its price. So I don't know why its up so much, but I am glad it is. I decided to sell half my holdings in the stock once it nearly doubled. I had a limit order placed so that it would automatically sell half my shares at the point it hit $7.20. I may sell more of my shares, but I'm going to think about that some. My opinion is that while the stock was a great buy at $3.61, now that its over $7 its no longer such a good bargain. The stock isn't likely to go up a ton more and the yield rate is now much lower. I will research other stocks and see if there are other good buys that I can move my money into. I explained before that I'm using a high dividend stock strategy. So my overall strategy has been to buy good value stocks with high dividend rates. The rest of my stock picks are doing pretty well overall. Five of the seven stocks that I've bought are up. Overall I'm up about 28% for my Roth IRA since Nov. 2008. By comparison the S&P 500 is up about 5% in that timeframe. I do have a couple picks that have lost money since I bought them. AT&T and GE are both down from what I paid. GE has lost a lot after they slashed their dividends. My Roth IRA holdings are : AT&T (T), GE (GE) and HRPT properties trust (HRP) bought Nov. 2008 and Harley Davidson (HOG), Hospitality Property Trust (HPT) and Vanguard High Dividend Yield Index (VYM) bought Jan 2009 plus some Bristol Myers Squibb (BMY) that I picked up in July. HOSPITALITY PROP TR HPT 38.87% ? VANGUARD HIGH DIVIDE VYM 10.24% ? Bad advice form Suze Orman : Pay off student loan before credit card. I watched an episode of the Suze Orman show from two or three weeks ago and she gave some advice to a caller that I considered pretty bad advice. The caller in question had a buyout offer from their employer of about $90k after taxes and they asked what to do with the money. They had about $60k in credit card debt and $27k in student loans at 6%. Suze told them to pay off the student loans, about half the credit cards and keep the remaining $30k or so in cash. That would leave them with about $30k in credit card debt and $30k in cash. Suze Orman told the viewer to pay off their student loan before their credit cards. I consider this pretty bad advice. What happens in bankruptcy should not be your primary reason for making financial decisions. You should not be planning for bankruptcy. Bankruptcy can happen to even the best of us if we get in the wrong circumstances and have some bad luck. So while you should be aware of what bankruptcy could happen, bankruptcy should not be the driving decision behind your financial planning. Paying off the lower 6% student loan first will cost them money. If we assume they have the average interest rate of 14% on their credit cards then paying off the 6% student loan first will cost them an extra $2,400 a year in interest on that $30,000. Even if the caller had a particularly low 9% rate on their credit card then they'd still be paying $900 extra by paying off the student loan before the credit cards. Lets say they had 14% rate on their credit cards and paid $600 to the loan monthly. It would take them 76 months to pay off the debt. If they instead had the student loans at 6% and paid $600 a month they could pay it off in 58 months. So over the life of the loans they'd be paying about $10,800 more with the credit cards and carry the debt for an extra 1.5 years. Do you think its worth an extra $10,800 to carry a credit card debt instead of a student loan simply because how the debts are treated in bankruptcy? Absolutely no, it is not! Suze should not be telling people to pay off relatively low interest student loans before higher interest credit cards simply based on the bankruptcy laws. Trent at The Simple Dollar gives Five Ways I Disagree With Dave Ramsey and I agree with him on those points. When I read the title of their article: If You’re Going to Consolidate Debt Then You Have to Stop Using Credit from Generation X Finance, I immediately agreed with it. BadMoneyAdvice recently wrote My Debit Card Confusion about how he is mystified that so many people use debit cards rather than credit cards. He cited an article that said that 50% of transactions are done with debit cards and that their use is on the rise. Personally I use a credit card for almost all of my spending. I put everything I can on my credit card. I do this because I get 1% or more cash back on all my purchases. At the end of the year this should add up to a few hundred dollars. But keep in mind that I pay off my bill every month. If you carry a credit card balance or have difficulty avoiding going into debt with credit cards then a debit card is probably your better option. If you pay off your credit card every month and don't have difficulty over spending then a good rewards credit card is a better choice. Looking at credit cards versus debit cards they each have different benefits and draw backs. If you pay off your bill every month then the benefits of credit cards outweigh their drawbacks and credit cards are more beneficial than debit cards. Financial Highway is hosting the 221st version of the Carnival of Personal Finance. This is the Labor Day Edition. My article Angie’s List : My First Impressions is included in the carnival. The other day a friend of mine mentioned that he had attended a free financial planning session hosted at our place of employment. I had vaguely recalled something about some financial services available at work but didn't remember the specifics. Apparently you can call them up and get a free appointment anytime. So after hearing about this I decided to go see if there were other benefits through work that I wasn't aware of. Free Financial Planning : Like my friend told me, you can get an appointment with a financial planner for free. Adoption Assistance : They will pay up to $5000 towards the cost of adopting a child. Scholarships for children: Children of employees are eligible to apply for college scholarships worth up to a few thousand dollars. Pizza Discounts : I can get 20% off at our favorite pizza place. Best Buy discount : I also apparently get 10% off at Best Buy. Flexible Spending Accounts : A flexible spending account lets you pay for certain things like out of pocket medical expenses with pre-tax dollars. I didn't know my work offered these. However, I've got an HSA so I can't do both. The benefit that will probably save me and my wife the most is probably the 20% off on pizza. We spend about $20 on pizza roughly once a month so 20% off will save us around $48 a year give or take. Finding out about that benefit easily makes this exercise worth my time. Maybe you've got some benefits at work that you aren't aware of. Why not go ahead and check. Look through your HR dept. benefits documentation or ask your manager about information on benefits. edit: Just to clarify, the discount on pizza and Best Buy are provided by the merchants for people that work at my company. Its not provided directly by my place of employment. Some large employers will get promotional discounts from merchants but I'm not sure how common it is. Find out about the History of Labor Day at the US Dept. of Labor. I just read the article Your Mileage My Vary by Trent at The Simple Dollar. Trent talked about how some frugal tips and practices are not for everyone and how some things work for some people and not for others. The basis of his article was a tip that someone suggested to him which he was not willing or interested in trying. I personally do a lot of frugal things. But there are many frugal practices that I currently do not do because I purposefully chose to spend money in those areas. But If I was broke or income was tight then I'd certainly do those things and give up the luxury. Other frugal practices are things I'd really prefer not to do if I can afford not to. Still other frugal things are simply not something I have any interest in doing because I consider them simply impractical or otherwise distasteful. Below I list what frugal things I do, might do and wouldn't want to do. Looking to buy some jewelry? Right now you can get 10% off on jewelry purchases at BlueNile through Ebates. Use promo code EBATES10 for the discount. The deal runs until Sept. 18th. You can also get 3% cash back from BlueNile via Ebates website. The 10% discount is not valid for loose diamonds or preset engagement rings. Prices, offers and Cash Back are subject to change. Restrictions may apply. When you use our Build Your Own Diamond Jewelry™ feature, offer applies only to the setting for a ring, earring, or pendant. Offer is not valid for any loose diamonds or pre-set engagement rings. Offer is not valid for any gift certificate, polishing cloth, or watch purchases. Reference code EBATES10 MUST be entered in cart or mentioned over phone at time of purchase. Offer may not be combined with any other offer, cannot be applied retroactively, and applies to US customers only. Void where prohibited. Offer expires 3 PM Eastern Time, September 18, 2009. My Money Blog has a reader in a tough situation trying to help his parents stay in their home : Ask The Readers: Parents Losing Home To Foreclosure Unfortunately it seems to me the home is far to expensive for the parents to ever afford and they should just sell it and move to a more affordable place. The BLS tracks statistics for on the job fatalities. Their report for the 2008 fatality figures just came out last month. So what are the most dangerous jobs? The overall fatality rate for all jobs is 3.6 fatalities. The dangerous nature of some of these jobs is more obvious than others. It might be a surprise to see jobs like "Refuse and recyclable material collectors" or Taxi Drivers on the list but no mention of police officers or firemen. The reality is that the largest causes of fatalities on the job are highway accidents and falls which account for about 23% and 13% of all fatalities respectively. So jobs like trash collectors, truck drivers and taxi drivers have higher fatality rates due to more highway accidents. Seeing fishermen and loggers at the top of the list may not surprise some people due to television shows such as Deadliest Catch or Ax Men which feature the dangerous nature of those jobs. This is not to downplay the dangerous nature of any particular job that didn't make the top 10 list, but statistically speaking in 2008 the people on the list above were most likely to have on the job fatalities and therefore the most dangerous in that respect. Right now my wife and I have ADT for our home security system. My wife purchased service with ADT for her home before we got married and signed a multi-year contract. When we got married and she moved in with me we just moved the contract over to our current home. ADT is costing us about $40 a month. This is pretty pricey. Once our current contract is up I'd like to switch to something more reasonably priced. So I decided to look for alternatives. I went searching on Home Depot for security systems that you can buy and install yourself. That is where I found the LifeShield alarm system. It costs $199 for the basic system at Home Depot. The basic unit acts as an alarm system for your home. It is advertised as easy to install and setup and it looks like thats the case. There is just a sensor and the base unit and you simply plug in the base unit to AC and phone. Monitoring is optional and theres no contract. So you can use this as a stand alone unit with no additional costs. If you do want to get the monitoring service then its just $20 a month with no contract. Have I mentioned yet that there is NO contract? I like that a lot. ADT and other services typically lock you into a 3-5 year contract. So you're not just buying an alarm system for $50-$100 promotional price, you're really agreeing to pay them $900 to $1500 over the next 3 years. Lifeshield seems to have all the features that ADT and the others carry. Here is a breakdown of Lifeshield versus the others. Note that that is marketing material from Lifeshield. We're locked into our ADT contract for a whiel. So I won't be changing our service anytime soon. But once we are ready to switch I'll be sure to take another look at Lifeshield. Kohl's currently has a lot of swimsuits in their clearance bin with items on sale for $4 and up Plus shipping is currently $0.99 per item. You can also save an additional 10% with code NEW137. They seem to have sold out most of the cheapest mens swim trunks. But there are still a lot of womens swimwear items for $4 range. Plus you can get an extra 4% cashback if you buy via Ebates. With all the foreclosures going on nowadays some renters are rightfully concerned that they could be evicted if their landlord will loses the property to foreclosure. Well thanks to a law signed by congress earlier this year called the "Protecting Tenants at Foreclosure act of 2009". Bottom line of the law is that if you are a renter and the property is lost to foreclosure you have at least 90 days before the new owners can evict you. - During the term of the lease, the tenant has a right to remain in the unit and cannot be evicted, except for actions that constitute good cause. - If the lease ends in less than 90 days, the new owner may not evict the tenant without giving the tenant at a minimum 90 days notice. - At the end of the term of the lease, the new owner may terminate the tenancy if the new owner provides a 90-day notice. - The new owner may terminate the tenancy if the owner will occupy the unit as a primary residence, and has provided the tenant a notice to vacate at least 90 days before the effective date of such notice. This is the only exception to the rule that the tenant may not be evicted during the term of the lease. Note the law is currently set to expire in 2012 so its not permanent.